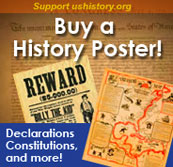 The Fifteenth Amendment to the U. S. Constitution provided that all male citizens were entitled to vote. In many southern states, the black population was so large and whites were fearful of their participation in the political process. The post-Civil War period during Reconstruction provides many examples how expansion of the franchise with the 15th Amendment also saw partisan and racially motivated efforts to limit African American voting participation. The assassination of Octavius Catto is a Northern example. Political cartoonist, Thomas Nast, frequently produced cartoons about voter suppression as depicted in The Election Before and After illustrates what happened in many southern areas. Images are powerful ways to actively connect students to historical topics. In the “Before” panel on the left, a smiling, well-dressed African American man holds a ballot before his face, putting a finger to his mouth in a gesture that suggests contemplation. A white person wearing a dress labeled “Southern Democracy” kneels beside him, looking up, smiling, and declaring “I am your best friend. I love you!” The Southerner is drawn as a figure of ambiguous gender, sporting a masculine goatee but also a stereotypically feminine dress (a long gown) and physical features (breasts and long hair, styled in a bun and braid). A four-tailed whip, labeled “The lost cause,” pokes out of the Southerner’s dress pocket. The caption for this panel warns “She is fooling thee! Trust her not!” In the “After” panel on the right, the African American man is running away from the Southerner, who swings the whip toward him and shouts angry epithets, while stomping on a piece of paper labeled “Colored Men’s Rights” and gripping another piece of paper (perhaps the ballot from the previous panel) tightly, crumpling it. Although the Southerner is still drawn with some stereotypically feminine features, the dress has been replaced by a pair of stereotypically masculine trousers, and the braid from the previous panel has been replaced by a chain. 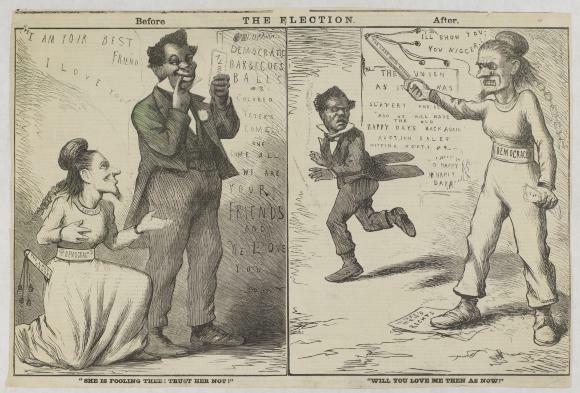 The accompanying caption asks “Will You Love Me Then as Now?” Overall, this cartoon comments on black voting rights in the Reconstruction South and attempts to curtail these rights. The captions for the two cartoon’s two panels reference popular songs that readers in the 1860s would have recognized. “She is fooling thee! Trust her not!” is a lyric from a song called “Beware,” which warns of “a maiden fair to see” who “can both false and friendly be.” “Will You Love Me Then as Now” is the title of a sentimental song originally published in 1853. “The Lost Cause” was the title of a book about the Civil War originally published by a Southern historian in 1866; the idea of the lost cause came to be associated with sadness over the Confederacy’s defeat in the Civil War as well as nostalgia for the “old” way of life in the pre-war South, before slavery was abolished and black men were able to vote. This cartoon is unsigned, so the artist cannot be identified definitively. However, we know that Thomas Nast was a regular anonymous contributor to Phunny Phellow, and so HSP’s HINT Project staff have tagged him as a (potential) artist for this cartoon. By Kimberly McCleary, Education Manager – Historical Society of Pennsylvania. Copyright © 1999-2019 by the Independence Hall Association, a nonprofit organization in Philadelphia, Pennsylvania, founded in 1942.